In commemoration of National Professional Social Work Month during March, the School of Social Work in Falk College presented its annual Dan and Mary Lou Rubenstein Social Justice Award program on Monday, March 19 at 6:45 p.m. in Grant Auditorium in the Falk Complex with a keynote address by Al-amin Muhammad entitled, “Many faces, many stories: The lived experiences of people who are homeless.” In partnership with the SU Libraries, the School of Social Work also introduced a new online resource to support social work research. Al-amin Muhammad is the founder of We Rise Above the Streets Recovery Outreach, Inc. who, along with The Rescue Mission Alliance of Syracuse, N.Y., were honored that evening with 2018 Dan and Mary Lou Rubenstein Social Justice Awards for their respective demonstrated commitments to service and social justice in the Syracuse community. We Rise Above the Streets Recovery Outreach, Inc. an organization that helps meet the immediate needs of the homeless by providing items such as food and clothing, in addition to providing education, encouragement and enrichment programs that aim to help break the cycle of poverty. The Rescue Mission has a long and positive history of uplifting humanity and building upon the strengths of individuals. 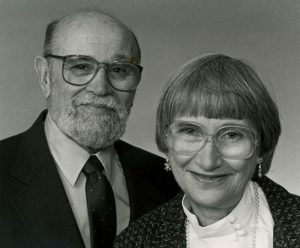 Presented for more than 30 years, the Rubenstein Social Justice Award is given in honor of the late professor Dan Rubenstein, a former faculty member in the School of Social Work and his late wife, Mary Lou, a former school social worker. Recipients of this award are role models whose courage and strength inspire others to stand up—and step up—to advocate and be a voice in the Syracuse community. The values of social justice are integral to their daily lives. The work of honorees each year, by their individual and collective examples, exemplify the true spirit of the Rubenstein Social Justice Award. To view photos of the event, please visit Falk College on Facebook.